Design by Community week 3: Materials and paint jobs. Hot rod flames FTW! It’s a work in progress, but most of the external features have been fixed and with the end of this week, the project will move to the innards – OS, connectivity, camera (the lens cover has already been selected). The choice of materials goes from the usual plastic, through higher end stuff like stainless steel and aluminum, to composite materials and Liquidmetal (they make tennis rackets, golf clubs and so on out of this stuff). From then on, it’s choice of finish – shiny (but keep a cleaning cloth at the ready) or soft to the touch (but it’s not “shiny”)? Throw in a custom paint job or keep it a single color? The last option is interesting – the field Durability has the “Super-strength” option. Skip the “Is it more powerful than a locomotive and faster than a speeding bullet?” jokes, I have a question – how many of you left that slider at “Normal”? You have the rest of the week to mull over these questions, next week (April 5th) the Design by Community project will be focusing on OSes. P.S. 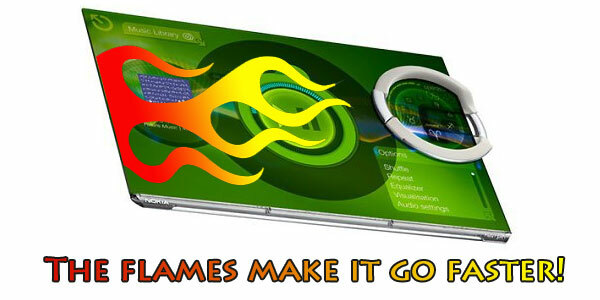 The image on top is the Nokia Morph concept (well, I added the flames). Come to think of it, the Design by Community phone is beginning to look like the Morph (large screen, thin frame), isn’t it?